OK I haven’t tallied up just how many exhibitions I saw in my two months in Tokyo, but it was quite a lot. I did try and sketch, where possible, various bits and pieces of works that caught my attention. The first exhibition I saw was of Venetian Renaissance paintings from the Gallerie Dell’Accademia in Venice. If nothing else visiting this exhibition made me realise that there is much to learn from any period, and it can be relevant to a contemporary art practice. I suppose the most important thing is to have an open mind. The first thing that struck me was realising just how I often make ‘realism’ the compositional basis of my work. 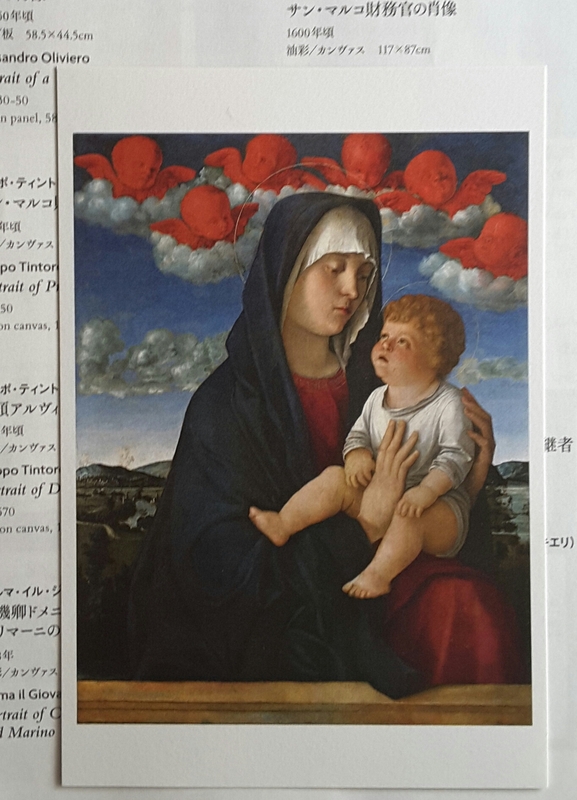 In the early rooms I encountered Bellini’s Virgin and Child (Madonna of the Red Cherubs) a piece of Surrealism if ever there was one! What was this man doing? 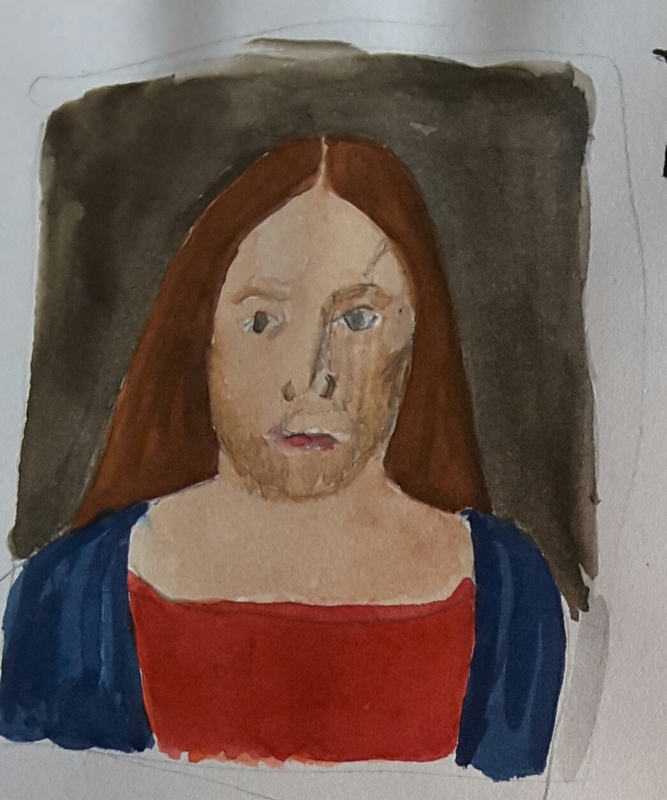 Chanelling more of the medieval approach to compositio than I anticipated, yet painting with a Renaissance appreciation for portraying realistic people and a depth of field. Want to get more of the story into your picture, but don’t have enough space on the canvas? Easy stick God and the Holy Spirit framed in a window. Well that what Giovanni Savoldo did with his Annunciation. Detail of Savoldo’s Annunciation, c.1538. 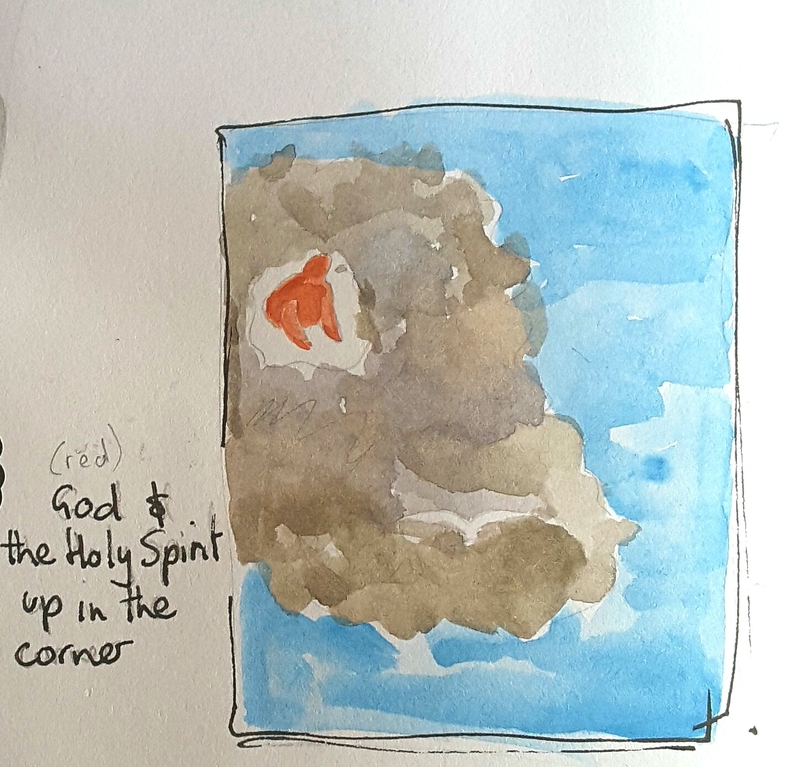 Pencil sketch in the gallery, with watercolour added later. This approach might seem a bit old-fashioned, then what did I see today, at The National Portrait Gallery (Canberra), but William Robinson’s double self portrait, Town and Country, 1990, where he uses the just the same device to portray different aspects of his life. In contrast to the dramatic gestures of many works, intended to evoke and reflect religious devotion, one of the strongest works I saw was a painting based on the simplest formats. Attributed to Francesco Bissolo, The Redeemer’s Head, 1500-10, is a symetrical, frontal portrait painted in an very limited palette. The Redeemer’s Head, 1500-10, attributed to Francesco Bissolo, original tempera on panel. My version pencil with added watercolour. 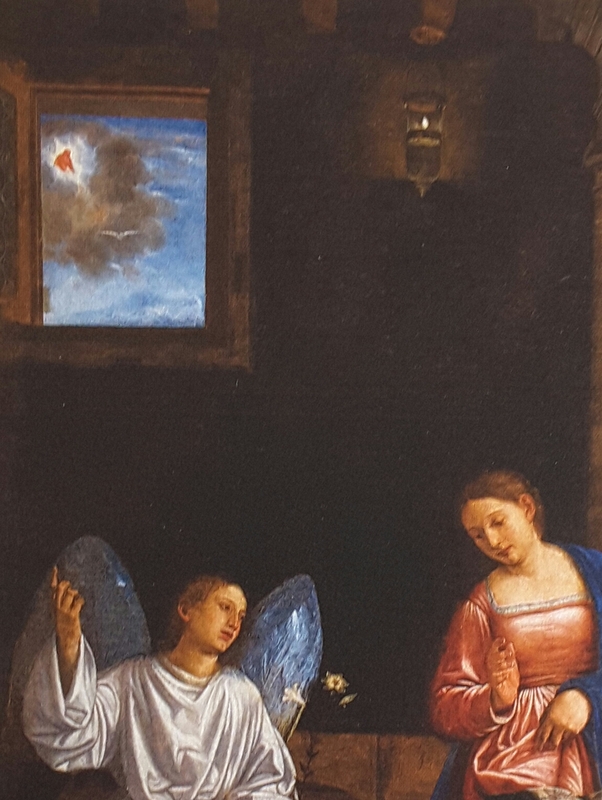 The highlight of the exhibition was Titian’s Annunciation, from the Church of San Salvador, 1563-65. The large 4 metre plus high oil on canvas was full of interesting details, sure to keep the easily distracted occupied during mass. 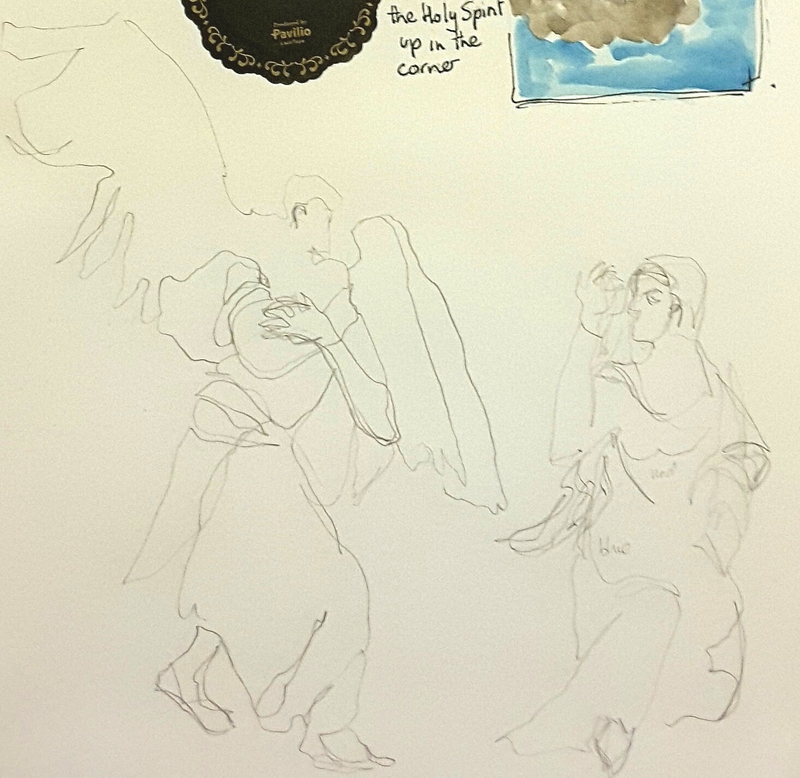 I sketched two details, firstly the key subject the painting, the angel visiting the Virgin Mary (who has coyly raised her veil to hide herself). Detail, The Annunciation, 1563-65, Titian, original oil on canvas. My sketch a ‘blind’ drawing in pencil trying to capture the dramatic posture of the angel’s wing. 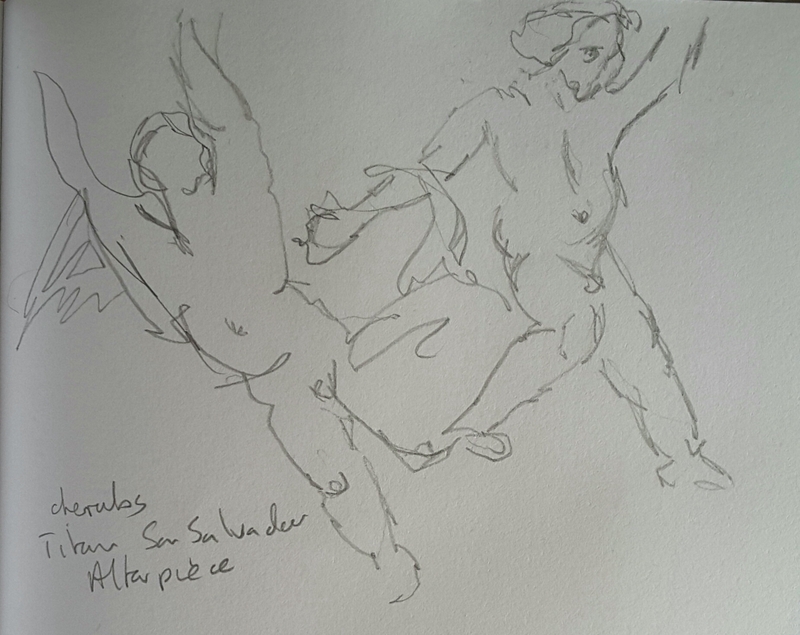 But I couldn’t resist the cherubs skittering around in the upper portion of the painting. Imay have seen just one too many Virgin and Child’s in this exhibition, but I did learn a thing or two.